Usain Bolt made history at the Rio Olympics, becoming the first athlete to win gold in the 100 metre and 200 metre sprints at three consecutive games. He didn’t beat his world record of 9.58 seconds, but still managed to leave his competitors for dust. It takes years of intense training and enormous discipline for athletes such as Bolt to achieve their Olympic dreams – and throughout it all they have to adhere to strict dietary requirements. To find out what sort of food it takes to fuel Bolt’s Olympic efforts, it’s worth taking a closer look at an Olympic sprinter’s ideal diet. Usain Bolt’s triple, triple, triple. More magic available at www.zapiro.com. 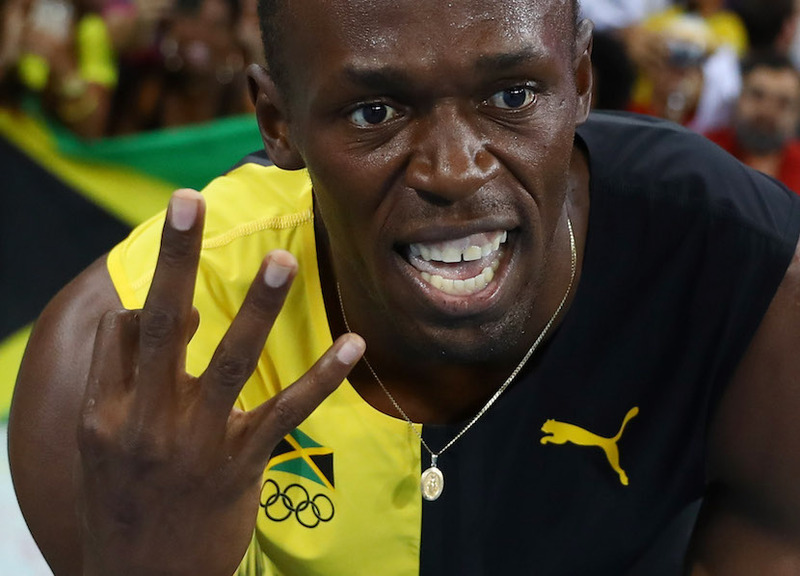 In the run up to the Olympic Games, Bolt would actually require more energy than during the games themselves. High quality preparatory training sessions use up a huge number of calories which need to be replaced with the correct nutrients. 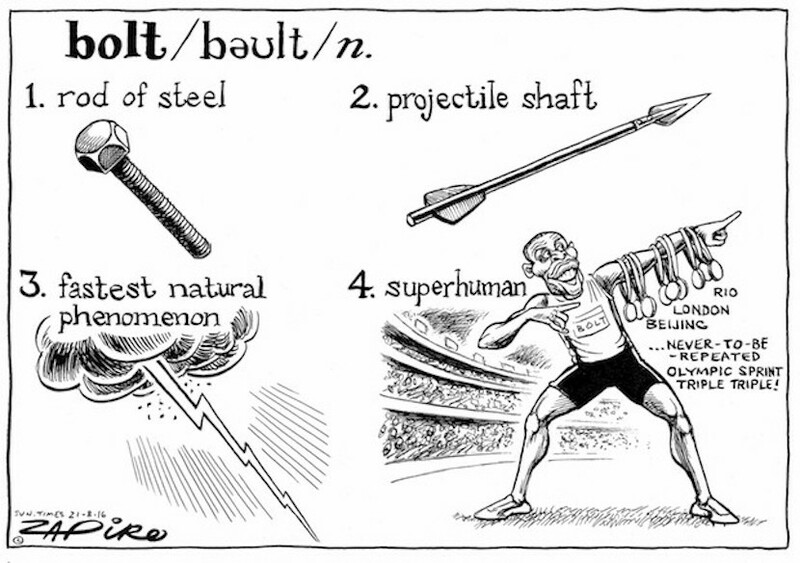 After all, these sessions are crucial in giving Bolt the all-important muscle power and technique that help him to gain the advantage over his competitors. During training, sprinters have to maintain a nourishing and balanced diet. This is predicated on the familiar mix of protein, carbohydrate, vitamins and minerals. Unlike some endurance athletes, sprinters don’t need to carbo-load with bread, potatoes, rice, pasta and cereals. Instead, protein – found in eggs, meat, fish, nuts, beans and dairy products – is perhaps the key dietary requirement. Protein allows muscles to recover, repair and develop after sprint and resistance drills which cause minute damages to the muscle fibres. Carbohydrates are still crucial for sprinters as sprint training also uses up a huge amount of a compound called glycogen. When we eat carbohydrate, it is broken down and stored by the body in the muscles and liver in the form of glycogen. Sprint training can deplete glycogen stores very quickly since it’s the only fuel available to the body at such high intensity effort. Bolt’s 100 metre world record time of 9.58 seconds isn’t long enough for the body to process the oxygen it needs and so energy is provided anaerobically – without oxygen – from fuels already found in the muscles. The all out effort of sprinting can use up most, if not all, of the glycogen stored in the body. During a training session, if Bolt is doing repeated sprints of 20 to 50 metres, the majority of his muscles’ glycogen will be depleted after about eight to ten efforts. Good nutrition is therefore vital to restock the lost glycogen and repair any routine muscular damage that’s been done. When the Olympic Games draws closer – and with the bulk of athletes’ training behind them – their energy requirements lessen and they look to simply maintain their weight. The good news for sprinters is that there’s a reasonable amount of flexibility with what they can eat the night before a medal race. Apart from adhering to the basic principals of a balanced diet, the main recommendations are to limit fibre intake and to avoid a high-fat meal – which can lie heavily in the stomach. Athletes should also stick to familiar dishes to avoid upsetting their digestion with food that they’re not used to the night before a race. Trying local delicacies is best left until after the games have finished. Rest assured, however, that there is some wriggle room, even in the diet of a world class sprinter. If Bolt’s fabled love of chicken nuggets is indeed true, then he wouldn’t have to constantly deprive himself of his favourite snack. Although eating fried food every day would cause an excess of fat in the diet, the energy demands on athletes are so high during full training that they can get away with more sweet treats and slightly more fat than the average person. So Bolt can afford to indulge as an occasional luxury, and if he’s just won a gold medal, he certainly deserves it. And although sprinters are recommended to have a slightly higher protein intake for repair and growth than the general population, Bolt’s diet is not fundamentally different to what an average person should be ideally looking to eat, except of course energy requirements would be higher. Most people should eat a well balanced mix of carbohydrates: pasta, bread, cereals and potatoes, and protein foods: meat, fish, cheese, egg and milk, beans and pulses as well as plenty of vitamin loaded fruit and vegetables. And there’s even room for the occasional indulgence, although the rest of us might not have quite as good an excuse as Usain Bolt for a high-fat binge. Emma Kinrade is Lecturer in Dietetics, Glasgow Caledonian University. This article about Usain Bolt first appeared at The Conversation.